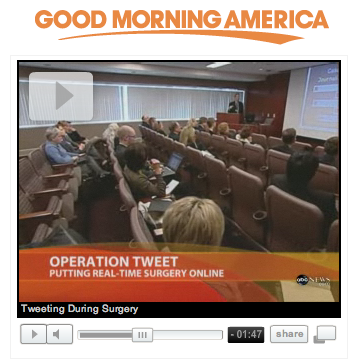 Mayo Clinic's use of social media was highlighted this morning in a story on ABC's Good Morning America (see the story). The story's focus was on medical organizations using Twitter, but that's just one of several social media tools Mayo Clinic is using to share in-depth medical information and to gather communities of Mayo Clinic employees, patients and their families. You can review posts in the social media category here on Sharing Mayo Clinic for some more detail on some of the platforms, but here's a quick list of ways you can take advantage of these tools. Follow Mayo Clinic on Twitter. If you're unfamiliar with Twitter, this post is a good introduction and also gives you five steps to getting started. Once you've "followed" Mayo Clinic please do a reply (@mayoclinic) to one of the "tweets" so we can follow you as well. It also will help your friends and followers on Twitter know about the Mayo Clinic Twitter presence. Visit the Mayo Clinic News Blog for in-depth information on recent Mayo Clinic medical and scientific research and other breaking news about Mayo Clinic. For instance, you can read about research into a simple fingertip test that may help predict future heart events, such as a heart attack, and can see an extended interview with the Mayo Clinic cardiologist who led the study. This 8:00 interview helps journalists better understand the research when they are producing news stories, but through the news blog we can make the full interview available to patients and their families, too, as soon as the studies are formally published. Visit the Mayo Clinic Podcast Blog, where you can see Mayo Clinic Medical Edge video stories and hear extended interviews with Mayo Clinic physicians. You can subscribe to have a particular category of podcasts sent to you automatically, or you can browse categories or search for specific topics. This post on POTS features an interview with Dr. Phil Fischer, and has become an even better resource because of the comments from listeners, which guided his answers as he responded in general terms to some of the specific questions. Become a Mayo Clinic "fan" on Facebook. This post provides more details. Visit the Mayo Clinic YouTube Channel. You can see video patient stories, latest research news, Mayo Clinic Medical Edge stories or browse through all of the videos. Subscribe to feeds from Mayo Clinic's various blogs and podcasts, to have the newest posts sent to you automatically. Each blog has details. Visit the blogs on MayoClinic.com for discussions related to Alzheimer's disease, Diabetes, Depression, Food & Nutrition, Quitting smoking, Pregnancy, Stress management and several other topics. Use CarePages to more efficiently keep family and friends in the loop when you or a family member are hospitalized. Share these resources with your friends. Each of these social media platforms has means (such as the sharing toolbar at the bottom of this post) that you can use to spread the word. An old-fashioned "cut & paste the URL" works fine, too. Mayo Clinic has been involved in social media for several years (beginning podcasting in 2005) and we've made significant progress, but there's much more opportunity, such as using tools like this for more efficient communication among Mayo employees. Here is information about the #tweetcamp that was mentioned in the Good Morning America piece, including the link to its Twitter feed. As we get more familiarity with these tools and their applications, look for the pace of change to accelerate. Lee Aase is manager of syndication and social media for Mayo Clinic.